“Mike Markel knows the secrets of high-wire storytelling. Deviations is a dangerous read.” – Clay Morgan, author of Santiago and the Drinking Party. Mike Markel is the author of the two books in the Detectives Seagate and Miner Mystery series: Big Sick Heart and Deviations. While celebrities and politicians are often under the media’s microscope, their wealth and privilege allows them to carry many of their darkest secrets to the grave. Those in power have one goal: maintaining a squeaky clean image – whatever it takes. “Itsy Bitsy Spider” is a could-be-ripped-from-the-headlines tale that provides a chilling and stirring reminder of the real-life secrets that thousands in power work hard to hide from those closest to them. When Claire McCallin, step-daughter of the powerful Boston Mayor Jack McCallin, hears her three-year-old daughter singing “Itsy Bitsy Spider” her life begins to spiral out of control. And when McCallin finds Claire and his granddaughter missing from his Belmont mansion, fearing Claire is about to disclose his dark secret, McCallin sets out on a mission; one that will silence his step-daughter. Never write what in a genre that is selling – only write what you feel passionate about. 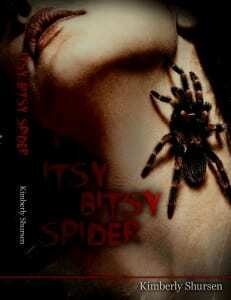 With a background in markeeting, Political thriller “Itsy Bitsy Spider” is Shursen’s debut novel. Hearing stories about abuse for years, the idea for the novel came from hearing of those in lower socio-economic groups who came forward, but rarely is there a story about abuse from those who are raised in a wealthy, powerful family. Knowing there are no boundaries for abuse, and wondering if the wealthy took their dark secrets to their grave,”Itsy Bitsy Spider” was born. Courtroom drama thriller “Hush” will be available in December of 2013.The story of two people who fell in love, only to have their life shattered when they find they are siblings, the angst novel pulls no punches when it comes to question the gray areas of abortion. Thriller “Lottery” will be available in the spring of 2014. After winning the that largest mega-million lottery in history, greed become murderous. And when Caleb Gillespie finds the love of his life, Ling Jameson, he will stop at nothing to keep her from learning the truth. After the ultimate betrayal, which is more important: trust or forgiveness? In KEEP NO SECRETS, the controversial follow-up to Compton’s debut legal thriller TELL NO LIES, a district attorney struggles to redeem himself after a one-night stand damaged his marriage and professional reputation. After surviving the private and public fallout from a one-night stand four years before, St. Louis DA Jack Hilliard wants nothing more than to be trusted again by his wife, Claire, and to earn back the respect of the community he serves. Since the day Claire accepted him back into the family, he’s vowed to be true to these goals, and so far he’s succeeded. But all of Jack’s efforts begin to crumble when the woman involved in his earlier downfall, Jenny Dodson, returns to town claiming threats on her life and asking for his help, and resurrecting for Jack long-buried emotions and questions of her guilt for the murder of a client. Just when he thinks the pressure can’t get any worse, his son’s girlfriend, Celeste, accuses him of sexual assault, and he suddenly finds himself on the wrong end of a criminal case, battling for his freedom. Can Jack trust his freedom to the legal system on which he built his career? Or will the ghost of his one-night stand four years before come back to haunt him, causing him to be convicted on the mistakes of his past? My novels are very character-driven. I like to combine the suspense of thrillers with the drama of human relationships. Be persistent and practice your craft. You can’t expect to win the US Open the first time you step onto a tennis court, so don’t think just because you’ve written “The End” on your first novel means you’re ready for publication. Julie Compton is the author of Tell No Lies, a legal thriller set in her original hometown of St. Louis; Rescuing Olivia, a romantic, contemporary thriller set in Florida; and Keep No Secrets, the sequel to Tell No Lies. Her novels combine the suspense of thrillers with the drama of human relationships. An attorney by profession, she now writes full-time from her home near Orlando, Florida. 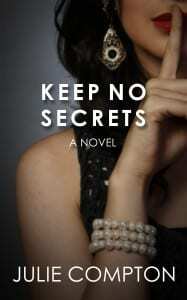 Keep No Secrets is a sequel to my debut, Tell No Lies (although it’s written to stand-alone for readers who haven’t read the first one). Tell No Lies featured a DA – a basically good, principled man – who damaged his marriage and ruined his reputation in the community after he succumbs to his obsession with a female colleague. His wrongdoing is discovered after the colleague is charged with murder and Jack is her alibi. I never intended to write a sequel, but the requests from my readers were so overwhelming, so I left the door open to the possibility while I went on to write my second (unrelated) novel. A few years later, at a Christmas Eve family gathering, my sisters-in-law began to discuss “who drives the babysitter home” after a night out with their husbands. All of them had this fear – a fear I’d never had when my children were younger – that if their husbands did the driving, they exposed themselves to a situation in which the wrong babysitter might make unfounded accusations against them. One of my brothers-in-law is a children’s musician, and we began to talk about how devastating such an allegation would be to someone whose livelihood revolved around kids. It was then that the idea sparked in my head: what if Jack was wrongly accused of a crime just as he’d begun to regain the trust of his family and community? Allow me to introduce myself. I’m a novelist. Also an infrequent poet. Most days, I would rather write than eat. I got my feet wet penning romances for Bantam Loveswept back in 1997. I published two books with them, then life got complicated (for a very long time), and things changed, including my preferred genre. 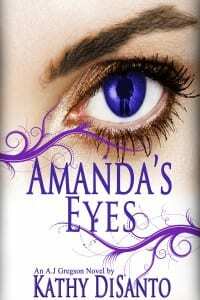 Now in what seems like the blink of an eye, it’s fourteen years later, and I’m publishing a near-future science fiction novel, Amanda’s Eyes. (If you’re curious about the plot, think murder and mayhem and a dash of “there are more things under heaven, Horatio.”) I’m already writing the sequel, tentatively titled Mind Games. Like the t-shirt says, I wasn’t born in Texas, but I got here as quickly as I could. Which wasn’t very quick at all. As a matter of fact, not counting a brief visit back in 1969, it took me decades. Hundreds, make that thousands, of turtles got to the Lone Start State before I did. Picture a small-town California girl chomping at the bit to break out of her hometown and see the world. That was me. About the time I graduated from high school, our friendly neighborhood United States Air Force recruiter offered me a ticket to ride. Sure enough, as soon as I signed on the dotted line, Uncle Sam whisked me off to exotic San Antonio for basic training; lovely Biloxi, MS, for more training (and hurricane Camille); then Washington, D.C. for the rest of my enlistment. So much for seeing the world. Four years and one honorable discharge later, I found myself in Pennsylvania Dutch Country, using my GI Bill to earn a bachelor’s degree in German from Millersville University and a master’s in same from Villanova. While at Villanova, I collected ample evidence to suggest I would never grow up to be a college professor. Let’s face it, very few universities consider the ability to lull 20 undergrads into catatonia in less than five minutes a hiring point. Ergo, I graduated with fluency but no marketable skills, although I did leave those hallowed halls with a fascination for language and a borderline obsession for grammar that have since proved useful. I spent the next decade or so as a stay-at-home mom to two sons (Leo and Nick), combating academic/business-speak, grammatical errors, and pesky typos as a freelance editor/proofreader for everyone from college students to professors to Armstrong World Industries. (You haven’t lived until you’ve proofread a flooring catalog.) Before I knew it, my sons were adults and insisted on being treated as such. Go figure. Pennsylvania wasn’t the laid-back West Coast I grew up on, but it was tolerable. Until the day the weather person cheerfully informed me the high would be six degrees with a wind chill of thirty below. At that point, I started to rethink the whole living-in-the-Northeast scenario. Nose and fingers dutifully protected against frostbite, I picked myself up off the icy sidewalk (again), wondering if this might not be the perfect time to head for warmer climes. One problem. My two incredibly talented and creative sons—musicians and artists, the both of them—flatly refuse to leave the frigid north for the sunny, drought-stricken, wide-open spaces. Adding insult to injury, my best friend recently moved up that way, too. In other words, I’ll probably be emigrating back up yonder before too long. Meanwhile, I write science fiction, work as a communications specialist, take brisk walks with Molly (my dog), read, and indulge in my latest hobby at the firing range. As mentioned on my homepage, I wrote two romance novels for Bantam’s Loveswept line. One of them, For Love or Money, won a 1997 Romantic Times Reviewer’s Choice Award. Thanks to my day job as a communications specialist with a major university, I’ve written more than one hundred features for print and the web. I’m a member of Science Fiction and Fantasy Writers of America, the Writers’ League of Texas, and the International Association of Business Communicators. Who among the identical twins is the murderer? Love to write mystery and detective novels. Currently working on a movie script. Book one of the Scott Cullen series. Ed James writes crime fiction novels, predominantly the Scott Cullen series of police procedurals set in Edinburgh and the surrounding Lothians – the first four are available now, starting with GHOST IN THE MACHINE which has been downloaded over 100,000 times and is currently free. His next book – SHOT THROUGH THE HEART – features vampires and werewolves but not Scott Cullen and is out on 31-October. Ed lives in the East Lothian countryside, 25 miles east of Edinburgh, with his girlfriend, six rescue moggies, two retired greyhounds, a flock of ex-battery chickens and eight rescue ducks across two breeds and two genders (though the boys don’t lay eggs). He works in IT for a living, commuting from Edinburgh to London every week (not every day) and writes mainly on public transport. His blog – edjamesauthor.com – is a log of his work, his thoughts on his writing, and a place for his word count OCD to express itself. His music tastes will creep in now and again. Private Investigator Sam Dyke turns down a job that would require skills that he doesn’t have – patience, computer-literacy, tact. Then he finds that the skills he does have – tenacity, aggression, street-smarts – are exactly the ones he needs for his next case – hunting down a cold-blooded murderer who seems to know what his every step will be. Altered Life is fast-paced, bitterly comic and introduces a tough new English private eye who knows what he wants and, usually, how to get it. “Right out of the gate, this is an amazing novel for first-time author, Keith Dixon.” – Ron Peters, POD People. “This great read harkens back to the days of the straightforward in your face detective genre. The author does not try to be “cutsey” or politically correct. He just tells a great story with an extremely proficient hero, Sam Dyke. I usually can figure these types of tales out by the middle of the book, but not this one. It will hook you early with the deviously crafted characters. An example of this fine writer’s skill is an attempted murder by a forced car accident. When I was reading this heart stopping passage, I found myself literally holding my breath. Keith Dixon has worked in higher education, as an advertising copywriter and as a business psychologist, and in most of these careers he was able to incorporate creative writing of one kind or another. About ten years ago he realised that he wanted to spend more time writing and less time earning a living, and since then he’s published three Sam Dyke private eye novels and a work of contemporary fiction called Actress. He’s currently working on another contemporary novel and there’s a further Sam Dyke book in the planning stage. He’s certainly spending more time writing, but he’s yet to crack the ‘earning a living’ part. 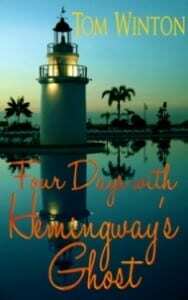 Four Days with Hemingway’s Ghost is not a story of spooks and goblins. It’s a powerful story about two men from two very different times. One man is mortal, the other is immortal. One is painfully ordinary, the other world famous. Jack Phelan is a forty-two-year-old underachiever who lives in South Florida. Although he mows lawns for a living, he’s not what you might expect. He’s got an exceptionally sharp mind and is a self-educated Hemingway aficionado. After Jack gets into an unlikely accident he’s flown by helicopter to the nearest hospital, where he remains in a coma for four days. But somehow, minutes after he blacks out, he finds himself in Key West, Florida–rubbing shoulders with an aged Ernest Hemingway. Hem has been sent back down to help determine whether or not Jack has what it takes to write a book for “The Main Man above the clouds.” But what Ernest doesn’t know is that the book is to be about him. And that its purpose is to change the world’s perception of the swaggering, hard-knuckled, macho myth he has become. Over the next four days, Jack Phelan and Ernest Hemingway travel to the legendary author’s old haunts and meet up with many of his long gone friends. Some of these reunions are rollicking good times, others are highly emotional tests of strength. But wait. When their time together comes to an end, the story is still not over. That’s when things really get interesting. Tom Winton was born and raised in New York City. During his working career he has done everything from working on a railroad gang in the Colorado Rockies to driving a taxicab in Manhattan. He has also been a mailman, a salesman, an entrepreneur and more. He lives in Hobe Sound, Florida, with his wife Blanche and their ill-tempered, but loveable, Jack Russell terrier, Ginger. They spend part of their time in Carmel, Maine. Tom’s debut novel, Beyond Nostalgia, was released in February of 2011. This book has more than once been likened to such classics as Catcher in the Rye and To Kill a Mockingbird. Praised as “a 20th century Gone with the Wind,” Beyond Nostalgia has been on four different Amazon Bestseller lists. Mr. Winton’s second novel, The Last American Martyr, came out in August of 2011. It has been on six Bestseller lists, at the same time.